Yay! Congrats! We are also expecting #3 due March 30th! So we will be counting down the days in March together =) Many Blessings! March 14 is a good day - that's my birthday! or March the 8th is also a special day - that's Bailey's birthday. Again Congratulations! So exciting! And so happy for you! Woo Hoo! 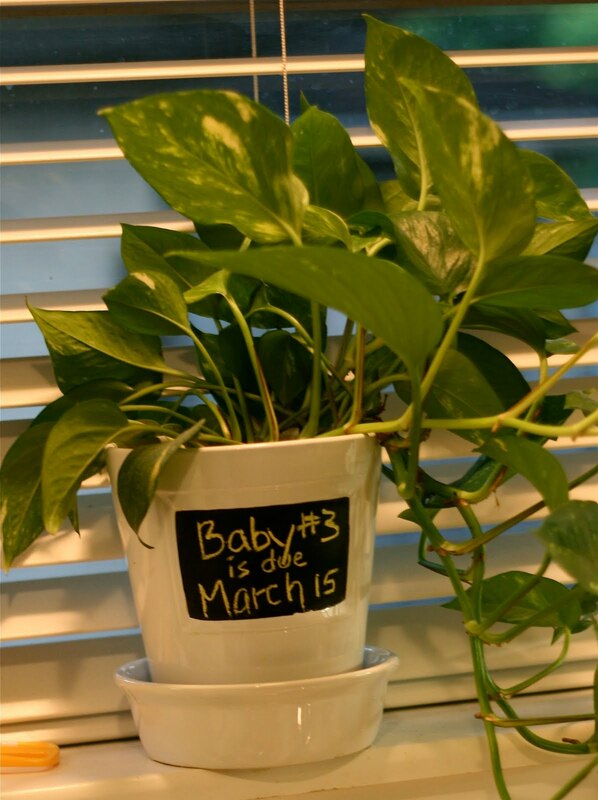 I love the little plant/chalk board announcement. It is such a fun way to chart each baby's progress and fun to see how the plant is growing as your family does. That little ivy will be so special to your family for as long as it lives. Congratulations sister! Love you. It may be a completly Baylor-in-the-90's thing to say, but "Bull NO WAY!" Congratulations! What a great family you are growing - so excited for all of you! Whoa! So I guess you, too, will be initiated into the three under three club. It's not for whimps, so you'll do great. If you ever need someone to talk to that understands that fairly unique situation you know where I am. :) Babies are a blessing--so happy for your growing family! Yay! Congrats Nicole!!! March 15th is my birthday and Kinsey's is exactly a week before on March 8th. We love March birthdays! WOW!!! So excited for you!! !